It was a disappointing first round of the Blancpain Endurance Cup at Monza for the Belgian Audi Club Team WRT, as bad luck hit the Audi R8 LMS cars of the Belgian squad since Sunday morning’s qualifying, in a day where changing conditions, with heavy rain at times, made tire choice difficult and resulted in numerous incidents, punctures and full-course-yellow or safety car periods. 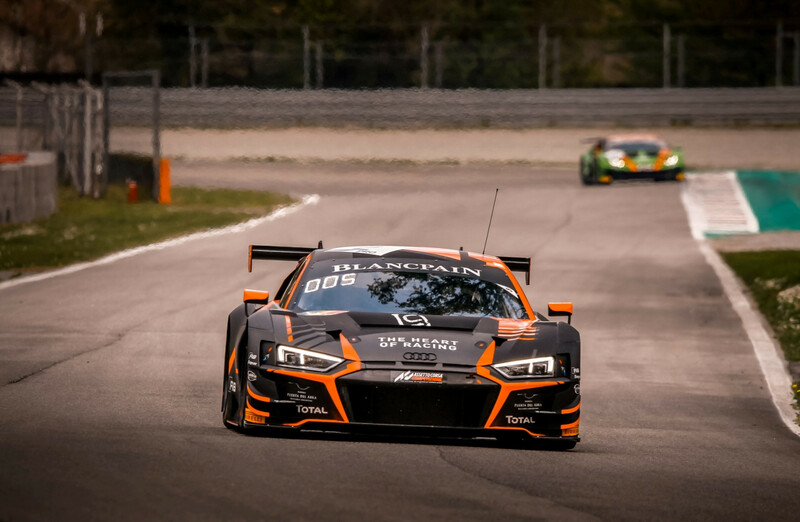 Car #2 of Álex Riberas, Ezequiel Pérez-Companc and Dries Vanthoor proved competitive and was in the top-3 throughout qualifying and the first part of the race, while car #10 of Ricardo Sánchez, Charles Weerts and Rik Breukers was bound to a podium finish in the Silver Cup. Unfortunately, a cascade of punctures hit several Audis including #2 and #10, sending them out of the top-10. Car #17 of Shae Davies-Paul Petit-Alex MacDowall could not even take the start following an accident in qualifying. On the positive side, the team leaves Italy having proven competitive in terms of path. The weekend started with somewhat reassuring indications, as car #2 ended Saturday activity as sixth-fastest in pre-qualifying, with car #10 in P23 and car #17 in P35, with very close gaps throughout the field. Heavy rain and foggy weather welcomed everybody on Sunday morning, with Qualifying taking place in challenging conditions. Team WRT’s Pro car took a brilliant 3rd spot on the grid, with car #10 qualifying in a good 18th position (and 5th in the Silver Cup). It was drama though for car #17, as Paul Petit was left with no other possibility than hitting a car in front of him that braked suddenly when overtaking another car in the treacherous conditions. Unfortunately, chassis damage on the front was too serious and the car had to be withdrawn from the race. Rain was still falling at the moment of the start, given behind the safety car. Álex Riberas kept third position, in contact with the front-runners, during the first half-hour, climbing up to P2 when the leader had to pit because of a puncture amidst of a full-course-yellow. In car #10, Ricardo Sánchez had a cautious first stint in P26. It was a late pit start (lap 28) for car #2 in order to check the evolution of weather conditions, with the rain ceasing and the track drying slowly. The team betted for slick tires and the move seemed to work as Pérez-Companc gained one position up to 3rd. Shortly after, though, the rain came back and the Argentine had to reduce the pace, dropping positions down to 12th. In car #10, on wet tires, Charles Weerts did an impressive stint, bringing his car back 9th overall just behind the leading car in the Silver category. With the track and the air getting damper, the choice for wet tires was obvious at second pit stop. After all cars pitted, and yet another safety-car period, Rik Breukers was 10th and Dries Vanthoor 14th. At the restart, they were in a compact group that fought fiercely, exchanging positions and providing a great show to the brave fans withstanding the conditions on the grandstands. 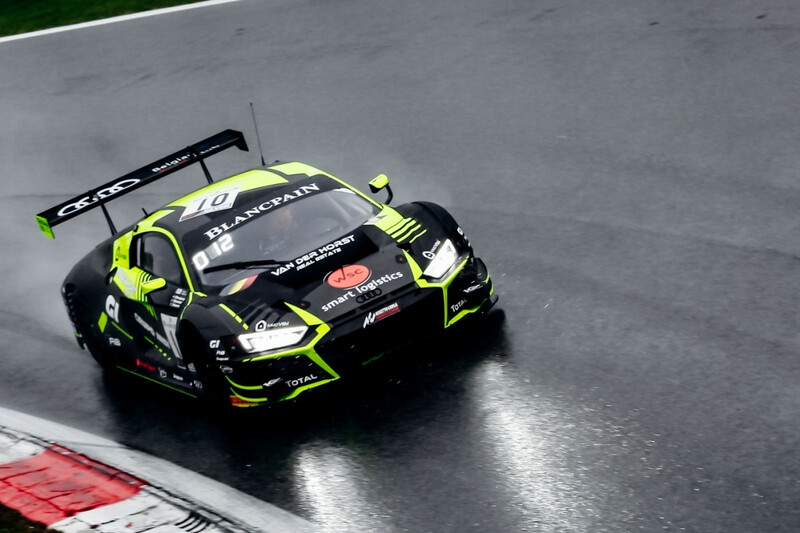 When they stabilized in P9 and P12, drama broke again as both Audis, as well as other cars, suffered punctures as wet tires started to deteriorate. Vanthoor eventually finished 18th while Breukers, who had to do almost an entire lap at very slow pace to get to the pits, was hit by another puncture, crossing the line in P27.